Walther traces a triangle between America, England and France as passion and political intrigue arrive by land and sea to a world on the brink of the Revolutionary War. 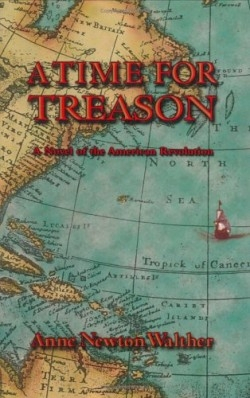 In an effort to avenge her parent’s death, whose ship was sunk by the British, Comtesse Eugénie Devereux de Beaumont takes an assignment from the French government to assess the anti-British sentiment in America. Since Eugénie is known as a skilled equestrian, she and her faithful maid, Marie, sail to Virginia under the auspices of purchasing horses. When the beautiful Eugénie shows up at the Whittington plantation in the Tidewater region of Virginia, only her hosts are aware of her status as a French spy. At both a thoroughbred auction and a governor’s ball, Eugénie meets and observes powerful political figures that include Thomas Jefferson and private citizens such as friendly St. George Tucker, the son of one of Bermuda’s richest shipping magnates, and the dashing Bridger Goodrich, a merchant shipper who refuses allegiance to any country. After a stable fire and the brutal murder of her French informant, Eugénie is forced to leave America and conduct her investigation in British-held Bermuda while staying with the Tucker family. Bridger volunteers to sneak Eugénie away on the high seas, where their dangerous romance blossoms. The change of scenery revitalizes the novel, bringing the tropical island under scrutiny and evaluating the extent of its historical significance during the war. The result is wildly interesting, since Bermuda doesn’t often find its way into American history books. The Tucker family recognized the need for open trade with the colonies, and St. George’s father Colonel Henry Tucker became a leader in the anti-British movement. The unsolved mystery of Tobacco Bay’s Gunpowder Theft on August 14, 1775, in which 100 barrels were stolen by Bermudans and transported to Philadelphia, becomes fodder for Walther’s historical drama. Loyal to the cause, Eugénie helps Colonel Tucker pull off the act of treason before she sets sail for home. Walther complements this lavishly entertaining tale with a helpful appendix to elucidate fact from fiction. The author is sometimes guilty of affected phrasing, running this debut novel perhaps longer than necessary, but her Eugénie is a bold heroine who is as good at charming officials as she is at battling pirates.